Steve was born in Milwaukee and spent his early years in southern California. As with any family, Steve has a did you know fact. Steve’s is: His father was Walt Disney’s accountant in the early days when Disney was building Disneyland in Anaheim. This gave him and his siblings special status and they spent many days roaming the back areas of Disneyland. Steve even had a birthday there and Walt drew him a picture of Micky Mouse. Middle school and high school were in Milwaukee. School was not a strong area of concern, but high school graduation came on time. Steve joined the Army in Milwaukee, signing up for field artillery because there was a $1,500 bonus (1972) and did not catch on to the “field” part of field artillery. Field artillery was one of the many duties during twenty-two years of service. Nuclear weapons and a couple of years as a Drill Sergeant at Fort Sill rounded out Steve’s military career. Duty stations included Fort Hood, Fort Sill, Turkey, and Germany. It was during his last tour in Germany where he met and married Nella. After retiring and finishing college, Steve taught elementary school for 10 years, and completed a masters degree in education at the University of Mary Hardin-Baylor before moving into real estate. 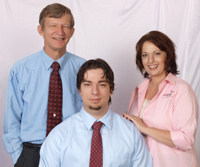 Real estate has continued to grow and now is a family business, redoak Real Estate with Nella and son, Brian.